God, in your grace, transform the world! 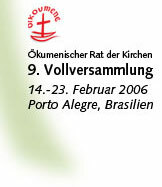 As guests and delegates to the 9th Assembly of the World Council of Churches to be held in Porto Alegre, Brazil, on 14-23 February 2006, we came from South and Central America and the Caribbean to learn about the challenges of our realities and reflect on the contributions we can make to the Assembly. Our meeting was marked by moments of intense spirituality nurtured by Bible studies and the spirit of unity that guided us every day. We are writing to you today to share the concerns, hopes and dreams that arose from this period of conviviality, reflection and communion. We heard about the demands imposed by the continuous and hostile presence of the Empire in all aspects of the lives of our peoples, which is tolerated and reinforced by the continent's dominant classes. Manifestations of these are the intolerable burden of the foreign debt, the widening of the gap between social classes, the implantation of foreign military bases and companies, in particular from the United States, the increasing violence, and the various expressions of discrimination and exclusion. We also heard about the strengthening of social movements, the building of Christian unity in an innovative manner, which is evidence of the progress made by the union between churches. We heard about the mission of churches and their support of and participation in the struggle for the respect for economic, social, and cultural and sexual rights. These are all indications that a new heaven and a new earth are possible, which we wish to share with the 9th Assembly. We reflected on the challenges posed by this reality, which in our view are, together with the diversity of faiths and the need for inter-religious dialogue, signals of the need to overcome polarization and conflicts with a view to a united Latin America. We also reflected on the need to give a voice to women, indigenous peoples and peoples of African descent, and ensure their participation; on the urgent need to provide spaces for youth; on the prophetic testimony required to respond to the demands of our peoples threatened by life-and-death situations (brought about by the Empire), and to oppose the various forms of religious consumerism developing in our world. We admit our mistakes and accept our limitations as churches in the face of these strong challenges. To incite and encourage youth to participate in the 9th Assembly so that they may contribute to the creation of a new ecumenical movement in Latin America, which recognizes their important role. To actively participate in the continual process of transformation of churches into inclusive, open, sharing communities committed to justice and peace, as an alternative to the dominant model of exclusion and religious consumerism. We rejoice in the presence of our God of grace, who accompanies, communicates with, unites, inspires and guides us, holding our hand and strengthening us in our weakness, struggles and dreams. We therefore open our hearts in prayer to be filled with the transforming power of God in our lives, in our churches, and in the whole world. This enables us to experience the deep spirituality incarnated in the values of the kingdom of God, which is manifested above all by the struggle for human dignity, justice and peace. We acknowledge with joy the hospitality offered by the churches of Brazil and the diversity and richness of their social customs, friendship and liturgical expressions. We welcome their testimony in the face of the social and political crisis the country is experiencing, in search of a guiding philosophy to help rebuild their dreams and hopes for peace and justice. We strongly support the popular referendum to be held on 23 October and the churches' campaign to say YES to life and NO to the arms trade in Brazil. And God, the giver of all mercy, who through your union with Christ has called you to his eternal glory, after you have suffered a little while, will himself make you perfect, steadfast, and strong. I Peter 5.10.